Hypnobabies (now updated, Edition 7) is a very successful 6 week, 3-hours per week, complete childbirth education course that was adapted with permission from Gerald Kein’s “Painless Childbirth Program” techniques rather than using simple relaxation, breathing or guided imagery like other hypno-birthing programs. This allows our Hypno-Moms to enjoy “eyes-open childbirth hypnosis”, easily remaining deeply in hypnosis while walking, talking and changing positions; being as mobile as they would like to be during childbirth. Hypnobabies is well-known for helping women to create much shorter, easier and more comfortable labors, making childbirth the joyful experience it was meant to be. Yes, really! Watch this video of a Hypnobabies mom who learned, practiced and used her Hypnobabies techniques well, having a birthing wave (contraction) at 7 cm, completely comfortable. Do you wonder WHO takes Hypnobabies Classes; what kind of people want an easier, more comfortable birthing using hypnosis? Click here, watch this video, and you’ll see! 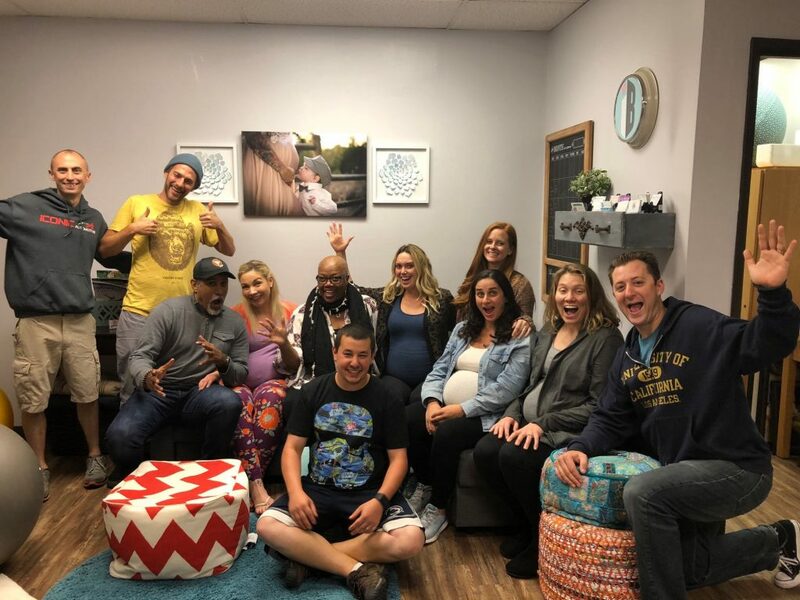 Find a Hypnobabies Class near you! Expectant mothers use our Hypnobabies Workbook, hypnosis audio tracks and hypnosis scripts to train their inner mind that contractions in labor will be felt mostly as pressure, tightening, pushing, pulling and normal baby movement sensations. Women are fully in tune with their babies during the birthing process, and as aware of everything around them as they’d like to be, easily able to communicate with their support team, and completely in charge of their own birth experience. It’s amazing to watch Camille’s Hypnobabies testimonial video – she shows us her experience of going shopping while being 4 cm, and video shows her experiencing 2 pressure waves at 8 cm with total comfort (the last clip shows the powerful pressure wave on the monitor). Yes, Hypnobabies works when learned, practiced and used as directed in our written materials. And … this is her testimonial video where she and her (previously skeptical) husband share their experience of using Hypnobabies! Hypnobabies uses the same medical hypnosis techniques that people employ when preparing for surgery without any drugs, which is called hypno-anesthesia. Our classes also teach Hypnobabies Birth Partners how to fully support the Hypno-Moms, and Hypnobabies is also used very successfully by single mothers. A willing Birth Partner is a bonus! This video shows a Hypnobabies mom in her pushing stage, and is the most gentle, easy birthing ever! Although not every woman will have a completely pain-free, unmedicated birthing experience, many of our Hypno-Moms do, and the rate of “completely comfortable births” reported is about 70%, far above any other childbirth method, which is very gratifying to all of us at Hypnobabies! In this video our Hypno-mom has several pressure waves and uses her Hypnobabies beautifully to remain calm, relaxed and hypno-comfortable! Find a Hypnobabies Class near you. Make sure to look for the certified Hypnobabies Instructors that teach our Home Study Advantage Classes to HypnobabiesHome Study Moms!